...is the inspiring words used by our beloved President, Franklin Delano Roosevelt to describe the sneak attack on the American fleet at Pearl Harbor on the morning of Sunday, December 7, 1941 which began at 0751.The results of this attack hurled this country into a global war which ended eventually with the defeat of the Axis powers in August 1945 and was the costliest war thus far on the face of the earth. We, at the World War II Stories -- In Their Own Words, have just acquired a series of images that have been loaned through the generosity of the fine folks at the Jackson Barracks Military Library, Louisiana National Guard, New Orleans and especially through the untiring efforts of the library's archivist -- Ms. Sherrie S. Pugh. We are including this selection of images -- the first installment of about 40 images in our World War II Stories -- In Their Own Words photo album for all to see. Some of these images have been published in books. 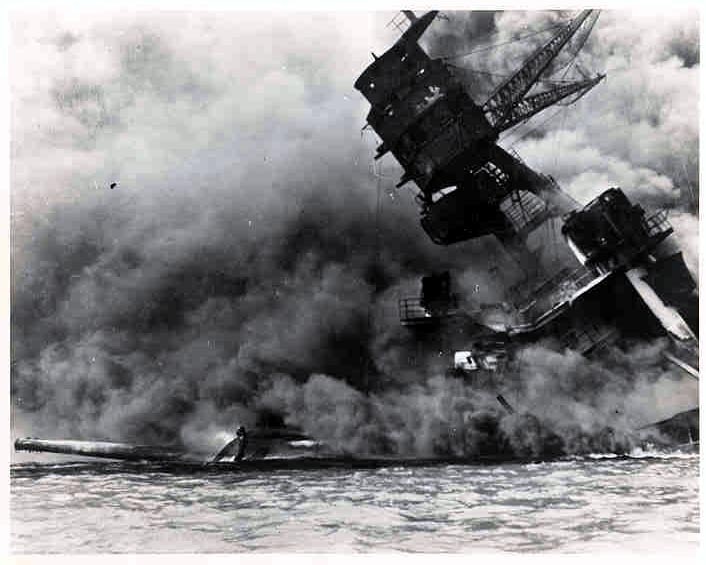 These are copies of the official Navy photographs of the attack on Pearl Harbor and its aftermath. The descriptive information included with these photographs has been added from other sources -- notated on each subsequent page. Any additional comments with regards to the events portrayed on the following images are welcomed by this webmaster. This series of pages illustrate some fourteen images from this collection of approximately 40 photographs. Additional photographs will be added at a later date. The memories that the following images invoke are important ...to keep THEIR MEMORY ALIVE! Thank you for viewing our collection of photographs. The following links are all active as of 15 September 2001.